We’ll provide some insights and review some of our DFS value players for week 10. Marcus Mariota (TEN) – Salaries: DraftKings (DK) – 4700, FanDuel (FD) – 6700. Mariota’s upcoming salary ranks him 26th/23rd on DK/FD, respectively for the position. Mariota posted a 21/29, 240, 2:0 line and 10-32-1 on the ground with 2 lost fumbles at Dallas last week. Mariota’s fantasy points of 24.8/22.8 ranked him 7th/7th on DK/FD, respectively. Mariota’s price per point efficiency ranked him 4th/6th on DK/FD, respectively. The betting line with the Patriots lists the game total at 46.5 points with the Titans as +6.5 point home dogs. The Titans’ implied team total is currently at 20 points and the Patriots are currently at 26.5 points. The Patriots give up the 7th most fantasy points allowed to QBs and rank 18th in DVOA against the pass. The Pats also give up the 3rd most rushing yards to QBs. Aaron Rodgers put up a 24/43, 259, 2:0 line and 4-8-0 on the ground against the Pats last week. Mariota ranks 4th in rush yards/gm for QBs with 31/gm. This is a bane to New England’s defense. Apparently healthy after his week 8 bye, Mariota gets a much better matchup this week than he had against the Cowboys. 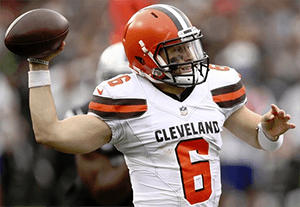 Baker Mayfield (CLE) – Salaries: DraftKings (DK) – 5400, FanDuel (FD) – 7400. Mayfield’s upcoming salary ranks him 16th/16th on DK/FD, respectively for the position. Mayfield posted a 29/42, 297, 2:1 line against Kansas City last week. Mayfield’s fantasy points of 18.88 ranked him 14th/13th on DK/FD, respectively for the position. The betting line with the Falcons lists the game total at 50.5 points with the Browns as +4.5 point home dogs. The Browns’ implied team total is currently at 23 points and the Dirty Birds are currently at 27.5 points. The Falcons’ defense ranks 30th against QBs in fantasy points allowed, 30th against WRs in fantasy points allowed, and 28th in DVOA against the pass. The Falcons also rank 29th in pass yards allowed per game with 304.3 and 29th in points allowed with 28.3/gm. Alex Smith put up a 30/46, 306, 1:1 line and 1-22-0 on the ground against the Falcons last week. The Browns look to have made an efficient turn in OC Freddie Kitchens first week on the job. Mayfield’s progress and efficiency should improve henceforth, and with an implied negative script at home against the Falcons’ “defense”, the matchup doesn’t get much better than this. Duke Johnson Jr. (CLE) – Salaries: DraftKings (DK) – 4700, FanDuel (FD) – 5600. Johnson’s upcoming salary ranks him 26th/38th on DK/FD, respectively for the position. Johnson posted a 1-8-0 rush line and 9-78-2 on 9 targets (all team-highs) against Kansas City last week. Johnson’s fantasy points of 29.6/25.1 ranked him 6th/7th on DK/FD, respectively. Johnson’s price per point efficiency ranked him 1st/1st on DK/FD, respectively. The Falcons rank 29th against RBs in fantasy points allowed and 20th in DVOA against RBs in the pass. There was never anything wrong with Duke. The sheer incompetence of the previous regime was his stranglehold, but that issue appears to have been eradicated by Kitchens. However, only one of Duke’s routes came out of the slot last week. That one slot route resulted in a TD, in the interior of the defense, where this week’s opponent is especially susceptible. This week’s matchup is right up Duke’s wheelhouse, and the implied negative script adds to his potential volume. Matt Breida (SF) – Salaries: DraftKings (DK) – 5000, FanDuel (FD) – 5900. Breida’s upcoming salary ranks him 23rd/27th on DK/FD, respectively. Breida posted a 12-44-0 rush line and 1-3-0 on 1 target on 27 snaps (49%) against the Raiders last week. Breida was pulled in the 3rd quarter in the route as he wasn’t needed. Raheem Mostert posted a line of 7-86-1 on 14 snaps (25%) but broke his forearm in the third-quarter and is now out for the season. The betting line with the Giants has the game total at 44 points with the 49ers as -3 point home favorites on Monday night. The 49ers’ implied team total is currently at 23.5 points and the Giants are currently at 20.5 points. The Giants are coming off their bye. The Giants’ defense rank 21st against RBs in fantasy points allowed and 18th in DVOA against the run. The Giants also rank 23rd in rush yards allowed with 122.4/gm and 22nd in points allowed with 25.6/gm. San Francisco ranks 4th in rush yards with 134.7/gm. Washington RBs combined for a 29-162-1 line and 3-16-1 on 4 targets against the Giants in week 8. Breida’s 5.5 YPC ranks 5th and his 531 rush yards ranks 9th. San Francisco’s O-line adjusted line yards ranks 9th against the Giants’ D-line which ranks 16th. Breida has been dealing with an ankle injury all season. His usage has been surprisingly high during this span, even with his near-mutant healing powers. Breida will now have an extra long week coming off no 4th quarter work to get his ankle right. With Mostert out, and a home favorite, Breida has sneaky appeal in a solid matchup against a tanking Giants unit. Aaron Jones (GB) – Salaries: DraftKings (DK) – 5000, FanDuel (FD) – 6500. Jones’ upcoming salary ranks him 23rd/20th on DK/FD, respectively. Jones posted a 14-76-0 rush line and 2-10-0 on 4 targets with a lost fumble at New England last week. The betting line with the Dolphins has the game total at 47.5 points with the Packers as -10 point home favorites. The Packers’ implied team total is currently at 28.75 points and the Dolphins are currently at 18.75 points. The Dolphins’ defense ranks 26th against RBs in fantasy points allowed and 17th in DVOA against the run. The Dolphins also rank 28th in rush yards allowed with 136.1/gm and 19th in points allowed with 25/gm. The Jets’ RBs combined for a 20-79-0 line and 5-63-0 on 8 targets against the Dolphins last week. Jones out-snapped Jamaal Williams 43 to 31 and out-touched Williams 16 to 9 last week. Jones lost some snaps after his crucial fumble, but was subsequently brought back. Green Bay’s O-line adjusted line yards ranks 4th against the Dolphins’ D-line which ranks 18th. Jones’ 6.0 YPC leads the league. As a big home favorite, Jones is set up with a nice matchup and circumstance this week. Maurice Harris (WAS) – Salaries: DraftKings (DK) – 3900, FanDuel (FD) – 5900. Harris’ upcoming salary ranks him 58th/33rd on DK/FD, respectively for the position, making him a much better relative value on DK. Harris posted a 10-124-0 line on 12 targets against Atlanta last week. Harris’ fantasy points of 25.4/17.4 ranked him 7th/9th on DK/FD, respectively. Harris’ price per point efficiency ranked him 2nd/4th on DK/FD, respectively. The betting line with the Bucs lists the game total at 51.5 (2nd highest on the board) with the Skins as +3 point road dogs. The Skins’ implied team total is currently at 24.25 points and the Bucs are currently at 27.25 points. The Bucs’ defense ranks 31st against WRs in fantasy points allowed and 31st in DVOA against the pass. The Bucs also rank 30th in pass yards allowed with 307.2/gm and last in points allowed with 34.4/gm. The Panthers’ WRs combined for an 8-93-1 line on 12 targets against the Bucs last week. Harris logged an 87% snap rate, 2nd on the team for WRs last week. Mo makes for a solid matchup play as long as Jamison Crowder (ankle) misses this week. Crowder has been ruled out for week 10. John Ross (CIN) – Salaries: DraftKings (DK) – 3900, FanDuel (FD) – 5600. Ross’ upcoming salary ranks him 58th/43rd on DK/FD, respectively for the position. The betting line with the Saints has the game total at 54 points (highest on the board) with the Bengals as +5 point home dogs. The Bengals’ implied team total is currently at 24.5 points and the Saints are currently at 29.5 points. The Bengals are coming off their bye. The Saints’ defense ranks last against WRs in fantasy points allowed, last again against QBs in fantasy points allowed, and 28th in DVOA against the pass. The Bengals also rank 31st in passing yards allowed with 311.4/gm and 27th in points allowed with 27.3/gm. The Rams’ WRs combined for a 16-274-2 line on 23 targets at New Orleans last week. A.J. Green (toe) is expected to miss the next couple of weeks. Green’s 76 targets, 687 receiving yards, and 6 TDs are all team highs. Green leaves a massive 25.7% target share available in his absence. Ross (groin) has missed three games and has yet to have a breakout game, but he has been a limited participant in practice. New Orleans is susceptible against the deep-ball, and that’s what Ross can do. With the implied negative script at home, against a New Orleans run defense that ranks 1st in rush yards allowed with 76.4/gm and 3rd in DVOA against the run, Andy Dalton should have to go aerial in this one. If Ross is healthy, his breakout-game potential won’t get any better than this. Amari Cooper (DAL) – Salaries: DraftKings (DK) – 5000, FanDuel (FD) – 6500. Cooper’s upcoming salary ranks him 29th/21st on DK/FD, respectively for the position. Cooper posted a 5-58-1 line with 8 targets, and 50 snaps (85%) against the Titans last week. Cooper’s fantasy points of 16.8/14.3 ranked him 13th/13th on DK/FD, respectively. Cooper’s price per point efficiency ranked him 8th/15th on DK/FD, respectively. The betting line with the Eagles has the game total at 43 points with the Cowboys as +6.5 point road dogs on Sunday night. The Cowboys’ implied team total is currently at 18.25 points and the Eagles are currently at 24.75 points. The Eagles’ defense ranks 29th against WRs in fantasy points allowed and 9th in DVOA against the pass. The Eagles also rank 25th in pass yards allowed with 269.1/gm and 5th (tied) in points allowed with 19.5/gm. In his first game as a Cowboy, Cooper’s stat line led the team in all categories. After being acquired for what is looking to be a decently high 1st round pick next April, the Texas-sized egos in Dallas are likely to force-feature Cooper to justify this audacious transaction. The Eagles are susceptible to perimeter receivers and the implied negative script should ensure high floor volume for Cooper this week, and for the foreseeable future. Vernon Davis (WAS) – Salaries: DraftKings (DK) – 2800, FanDuel (FD) – 5100. Davis’ upcoming salary ranks him 22nd/22nd on DK/FD, respectively for the position. Davis posted a 5-62-0 line on 7 targets against the Falcons last week. Davis’ fantasy points of 11.2/8.7 ranked him 11th on both DK/FD for the position. Davis’ price per point efficiency ranked him 10th/10th on DK/FD, respectively. The Bucs’ defense ranks 31st against TEs in fantasy points allowed and 29th in DVOA against TEs. Greg Olsen put up a 6-76-1 line on 6 targets against Tampa Bay last week. Vern’s snap rate of 46% nearly matched Jordan Reed’s 54%, but Vern out-targeted Reed 7 to 6 last week. This is a near 50% time-share, but Vern is cheaper and both get a great matchup. Jimmy Graham (GB) – Salaries: DraftKings (DK) – 4600, FanDuel (FD) – 6300. 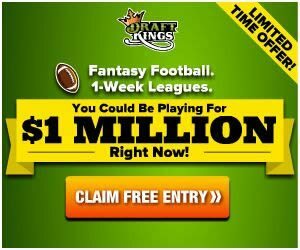 Graham’s upcoming salary ranks him 8th/7th on DK/FD, respectively for the position. Graham posted a 4-55-1 line on 6 targets at New England last week. Graham’s fantasy points of 15.5/13.5 ranked him 5th/8th on DK/FD, respectively for the position. The Dolphins’ defense ranks 22nd against TEs in fantasy points allowed and 14th in DVOA against TEs. The Jets’ TEs combined for a 6-74-0 line on 8 targets against the Dolphins last week. Graham’s targets, catches, yards, and TDs, ranks 2nd on Green Bay, behind only Davante Adams. Being Aaron Rodgers #2 target in a good matchup is never a bad thing.